Rachel Johnson retired as of May 2018 having been a faculty member at UVM since 1991. Rachel Johnson is a well-known expert on national nutrition policy, pediatric nutrition, dietary intake methodology and energy metabolism. 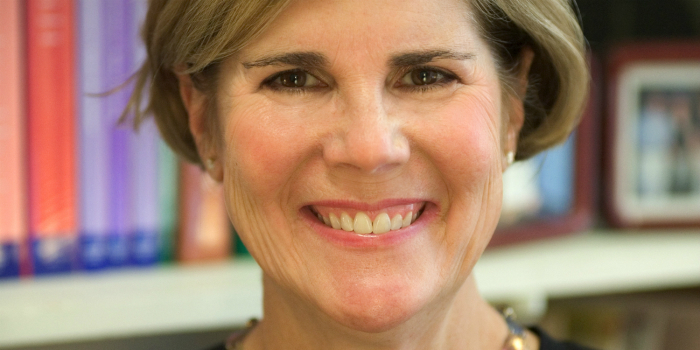 She serves as Chair of the American Heart Association Nutrition Committee. She is a former Professor of Nutrition and Food Sciences, Dean of the College of Agriculture and Life Sciences and Associate Provost of UVM. Lichtenstein AH, Carson JS, Johnson RK, Kris-Etherton PM, Fulgoni VL, Pappas A, Rupp L, Stitzel KF, Vafiadis DK. Food intake patterns assessed by using front-of-pack labeling program criteria associated with better diet quality lower cardiometabolic risk. Am J Clin Nutr, 2014;99:454-62. Yon BA, Johnson RK*. Dietary Patterns and Sugar-Sweetened Beverage Consumption among Adolescents and Adults. Current Nutrition Reports 2014, published online January 5, 2014 - http://link.springer.com/journal/13668. Yon BA, Johnson RK*. Elementary and middle school children’s acceptance of lower-calorie flavored milk as measured by milk shipment and participation in the National School Lunch Program. J School Health, 2014,84:3:205-211. Amin SA, Yon BA, Taylor JT, Johnson RK*. When fruits and vegetables are optional, elementary school children choose processed over whole offerings. J Child Nutr and Mngt, Vol 38: Issue 1, Spring 2014. www.schoolnutrition.org/Content.aspx?id=20312. Johnson RK. Front of Pack Labeling - Healthier Diets and Better Health or Confused Consumers? Nutrition Bulletin, 2014;39:235-237. American Heart Association National Spokesperson, 2009-present. Food Day Advisory Board-Center for Science in the Public Interest, 2010-present.